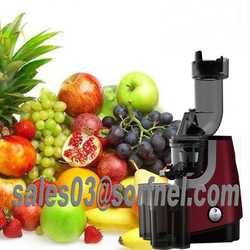 4,Slow speed screw type squeezing out every drop for maximum juice yield. 6,BPA-FREE, impact-resistant ABS plastic body. 7,Heavy-duty tritan strainer and auger are 8 times stronger than traditional plastics. 2,Highly efficient juice extraction . 3,Rotate a speed of 40-65 revolutions per minute. 4,BPA-FREE, impact-resistant ABS plastic body.